Tired of winter yet? Wait, it’s February in Wisconsin–that’s probably a silly question. Even if you’ve had enough, the Milwaukee Art Museum’s current display of works on paper from the Collection, Winter in Color, might make you take another look at the season. Until the Renaissance, winter scenes in Western art were few and far between. Not only was there a lack of interest in landscape as a subject, but also, during winter, much of Europe struggled to find food and warmth, let alone create art. Today, even though groceries are well stocked and buildings have central heating, winter is often seen as bleak, forbidding, and colorless. But there is a hidden beauty in the cold and snow, one that, with a closer look, is alive with all sorts of hues. 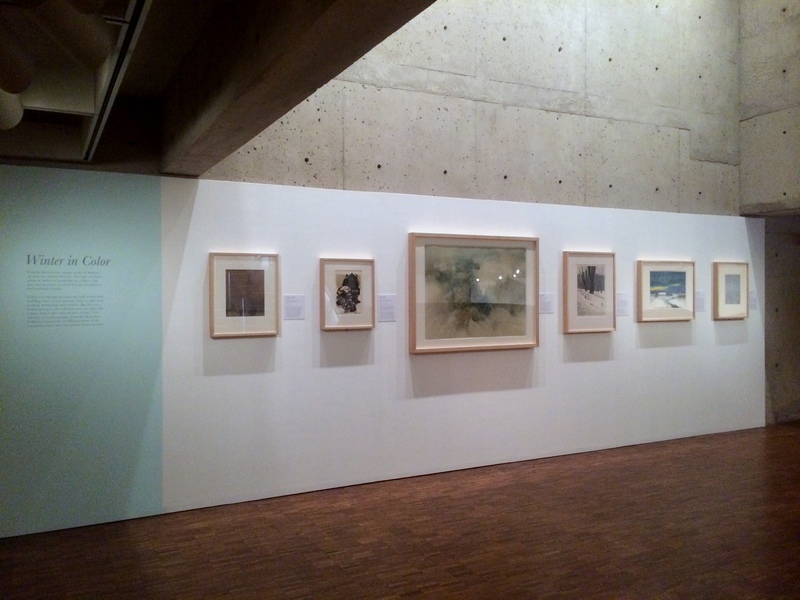 The rotation on view on the Mezzanine, a selection from the Museum’s collection, shows how six different artists of the 20th century have interpreted winter in color. In this post, we’ll take a look at two of them. Emil Nolde’s independent personality and interest in color made him one of the most important Expressionist artists. Associated briefly with the avant-garde groups known as Die Brücke and the Berlin Secession, he was continuously pushing the boundaries of art. 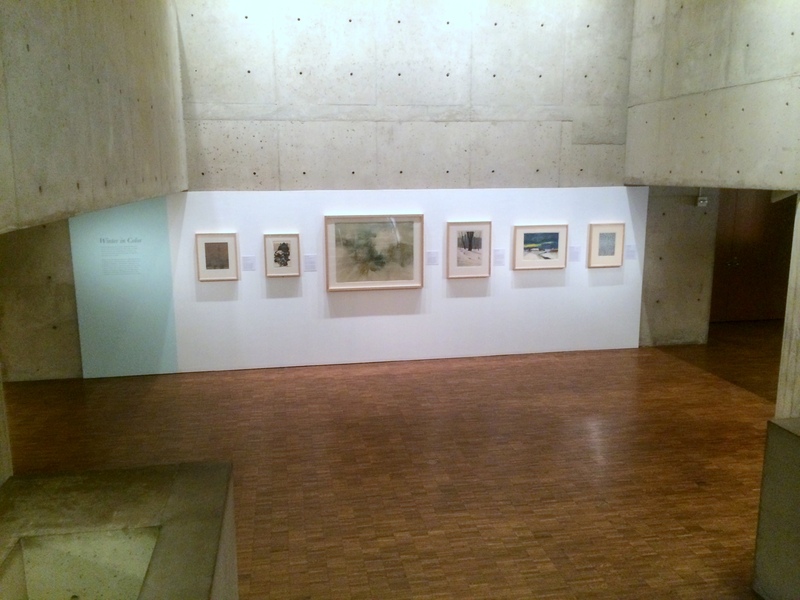 He was particularly interested in printmaking in the first two decades of the 20th century. We are lucky enough to have a significant collection of prints by Nolde, including the woodcut <a href="http://collection.mam.org/details.php?id=8799&quot; target="blank">Dancers and the color lithograph Music Hall III. After a trip to the South Seas, Nolde became distrustful with the policies of colonialism and stopped using the urban, modern subjects of his earlier work, and in 1927, he returned to his homeland in the northernmost part of German near the Black Sea. His love of this area is obvious; as early as 1902, he had changed his name from Hansen to Nolde in honor of the village of his birth. The 1930s saw Nolde and his wife settle into a farmhouse in Seebüll. Interested in watercolor for its transparent hues and serendipitous possibilities, he explored the dramatic and emotional aspects of both landscapes and flowers in this medium. In Cottage on the North Sea in Winter, Nolde has captured the emotionality of the winter landscape. The masterful watercolor is a view from Nolde’s home towards the neighboring farm at Hülltoft. Nolde left the white of the paper as the snow, and used a violent slash of blue and yellow for the edge of the Black Sea that breaks through the clean, cold ground cover. Meanwhile, the low-slung cottage holds its own against the vibrant sky, which is weighty yet comforting in its power. Nolde wet the paper, allowing the vibrant watercolors to pool and merge, almost out of his control. Both his technique and subject matter are a comment upon the union of man, landscape, and the elements. Nolde’s long career spans the years of Nazi-controlled Germany. Initially supportive of the idea of a strong Germanic identity, he was a member of the Party in 1933 and 1934. Soon, however, much of his art was removed from German museums as “degenerate”; a total of 1,052 works were confiscated, the most of any artist. From 1941, he was prohibited from creating art but secretly continued to work in watercolor. After the war, he continued to work and received recognition for his career. Born, raised, and trained in Japan, printmaker Keiji Shinohara now teaches at Wesleyan University in Middletown, Connecticut. His work combines a contemporary subject matter, usually abstracted landscapes, with the traditional Japanese woodblock technique of Ukiyo-e prints. Ukiyo-e, meaning “pictures of the floating world”, developed in the 17th century in Edo (now Tokyo) and was popular into the 19th century. The name comes from a Buddhist concept related to the sadness of life, but it became associated with the worldly pleasures of middle class Japan. According to the Japan’s social hierarchy, the merchant class was the lowest; with the increase in trade, however, the merchants amassed great wealth. This discrepancy between social and economic status led them to spend their money to commission artwork of their own, mainly in the form of color woodblock prints. The prints ranged in subject from high-culture literary and visual themes to contemporary topics such as courtesans and kabuki actors. Ukiyo-e creates a multicolored print through the use of multiple woodblocks, one for each color. This working method was developed in Japan in 1765 and eliminated the need to hand-color black and white prints. For centuries, Japanese artists have been interested in depicting the seasons, and that is no different in Ukiyo-e prints. Japan’s indigenous religion, Shinto, encourages the contemplation of earthly cycles in order to connect the present to the past. In a society based upon agriculture, understanding and appreciating the seasons is important for survival. In addition, Buddhist beliefs, which are often conflated with Shinto ideas, emphasize the inevitability of change. Sometimes, all four seasons are shown in one work, illustrating the gentle progress from one to the other. One of the most familiar subjects of Japanese art, the cherry blossom, is a perfect example of appreciation of the temporary beauty of nature. Since more than half of the country receives significant snowfall each year, winter has always been of particular interest. Keiji Shinohara’s Winter Garden explores winter through his masterful woodblock technique: he studied Ukiyo-e for ten years. In this print, there is balance between calm and activity. The stark, dark trees at the bottom counter the light, almost transparent leaves that float in the sky. The delicate blues of the print may seem cold at first, but the warm purple undertones invite contemplation. 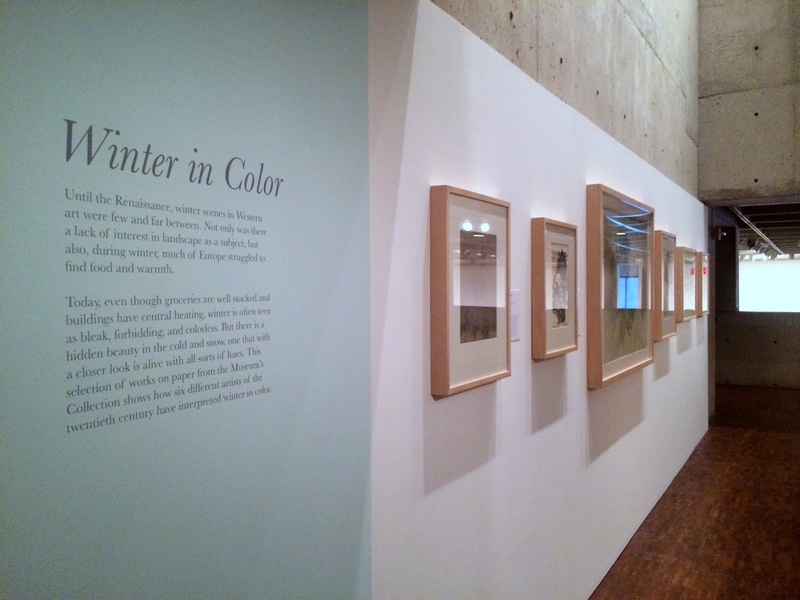 Shinohara’s composed work is very different from the emotional color of Nolde’s, but each shows his appreciation of a season that might otherwise be overlooked. Besides these two works on paper, you will find a lithograph by Harold Altman (American, 1924-2003); a pastel by F. Usher De Voll (American, 1873-1941); a woodcut by Danny Pierce (American, b. 1920); and a watercolor by Lee Weiss (American, b. 1928). Many of these artists have Wisconsin connections. And if you are looking forward to warmer weather, don’t give up hope! I suggest that after you take the stairs up from the Mezzanine to the Bradley Collection, head to the left, and on the first wall will be Emil Nolde’s Roses on Path–a beautiful painting of his farm in Seebüll during the summer. This entry was posted in Art, Behind the Scenes, Curatorial and tagged Emil Nolde, Exhibitions, German Art, German Expressionism, Japanese Art, Keiji Shinohara, Milwaukee, printmaking, winter, wisconsin, works on paper. Bookmark the permalink. I never knew that winter scenes weren’t popular until the Renaissance (always, with a modern-day outlook, thinking that artists just painted what they wanted!). Thank you for this very informative article, and I’ll look for this show on the Mezzanine!